In 2016, 78 percent of the U.S. population had at least one social media profile. By 2018, an estimated 2.5 billion people around the world will be social media users. Those numbers are huge, and prove just how important social media is for anyone looking to make their mark online — bloggers, solopreneurs, direct sales reps, and freelancers can all benefit from the power of social media. But, social media can be confusing. Especially when just starting out. Sure, you may have used Facebook, Twitter, and Pinterest to share photos and keep in touch with friends. But how do you use social media as an effective marketing tool? Good question! There’s a lot of trial and error. And just when you find something that ‘works’ — bam, you’re hit with an update that makes your way of doing things no longer effective. But don’t worry — there are tried and true basics that you need to know, and it all starts with a plan. Deciding where to focus your marketing efforts is just about as important as how you will implement your networking strategy. So, before jumping into the social-media waters, decide which social networks you’ll use to better your online business. It’s ideal to focus on a few social media channels. Trying to be the best on all platforms is, well, exhausting and typically ineffective. Think about where your customers hang out and focus your efforts there. For example, if you’re a wedding photographer, your time would be best spent on Pinterest or Instagram where pictures take center stage. If you’re a freelance writer who specializes in blogging, you may benefit most from Twitter, Tumblr, and Facebook. Whatever it is you do, think about where your clients spend their time online and go there. Once you know where you’ll concentrate your social media marketing efforts, it’s time to start, well, getting social! And, honestly, this is easier said than done. Sure, with personal profiles it’s easy to share — upload a few snaps of your weekend, share a funny meme, comment on a post or two and done. But as a business, you’ll need to share and post with purpose, each and every time. Whether you’re sharing blog posts you write, current news related to your industry, or a silly gif just for fun, you should be following a social media content calendar. A calendar ensures you’re not posting too much, effectively annoying your followers. But it also helps you see if you’re not posting enough which can lead you to alienate your audience. Whichever platforms you’re using — Pinterest, Facebook, Twitter, etc. — decide how often you’ll post to each network every day and stick to it. If you share something on one network, share it other places too. This is especially true for bloggers who painstakingly craft posts — it would be a shame not to get new content in front of as many eyes as possible! But freelancers, direct sales pros, and online business owners benefit from this strategy too. It helps keep all your channels consistent and will save you tons of time tracking down and finding things to share. 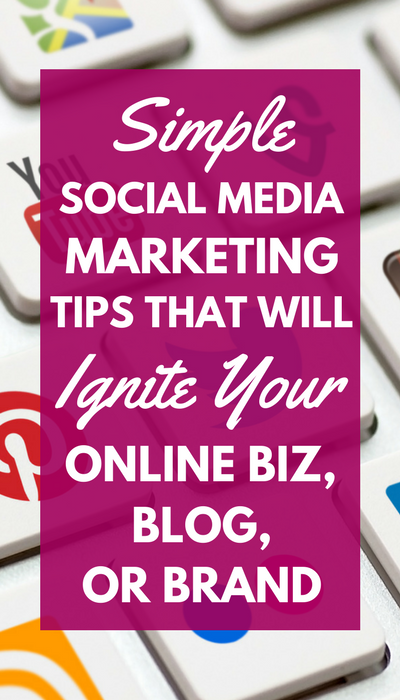 My favorite tool for seamlessly sharing one piece of content across multiple channels is Canva. You can take one blog post and create custom share-worthy images meant for different platforms. On Pinterest? No problem! Twitter? Easy peasy. Facebook? Covered. Really, Canva will save you tons of time and energy creating images to share across all your different social channels. When using social media for business, you need to find your social media voice and stick with it. If you start out using a casual, conversational tone but then switch gears to a very formal and businesslike approach only to go back to a more light-hearted style, you’re going to confuse your followers. Make sure you define your social media voice early on — Will you be helpful? Funny? Sincere? Dramatic? Professional? There’s no right or wrong answer. Just keep it consistent — social followers (aka potential customers/readers/followers) will come to rely on a certain style and tone — don’t disappoint them with a completely different approach each every time you post. Yes, you’ll be using social media as a business or professional but you shouldn’t abandon your sense of self in the process. That is, let followers know there’s a real person behind your social media accounts — even if you’re acting as a business entity. The whole point of social media is to be social. Respond to comments people post on your profiles and pages. Interact with followers. Ask them questions. People will appreciate your personal approach to social media, even if you’re acting as a business or brand. 6. Don’t Over Promote Your Products/Services/Self. Ever. The whole point of social media marketing is to drive sales or promote products, right? Wrong! Yes, when done correctly, sales will surely follow. But you shouldn’t be on social media just for the sake of making a buck or two. In fact, you will alienate followers and turn off potential customers super quickly if all you do is promote or try to sell on social media. Plus, you’ll look spammy — not exactly the image you should strive to create as a professional. Instead, focus on building relationships with people first. And then, when appropriate, sell them on things that will actually provide value to them. Once you establish a trusting relationship with followers, they will be more apt to buy what you’re selling. I know I said the whole point of social media marketing is to be social and that you should be the human element behind your profiles. But when you’re a one-woman (or man) show, it’s impossible to be glued to your computer 24/7 waiting to send out the next post, tweet or update. Instead, rely on automation to help you be ever present as a business. Buffer and Hootsuite are two great (and free!) options to consider as a beginner. And if you’re ready to slay your Pinterest presence and flood your site with traffic, Tailwind is your new best friend (and exactly the tool I used to gain 30,000 followers in under 2 years). You can give Tailwind a try for free to see just how awesome it is at authentically automating your Pinterest presence. These tools will also help you create a consistent content calendar that you and your followers can come to rely on. And last but certainly not least — don’t give up! Social media marketing is tough. There’s not a one-size-fits-all solution that works for every business, blogger and brand. You’ll have to dive in and get your hands dirty to figure out what works and, more importantly, what doesn’t. And keep trying — don’t expect overnight success and don’t give up when the going gets tough. Try something new. Change up your approach. Learn a new technique. And, if you have any questions, ask away in the comments section below! The post 7 Simple Social Media Marketing Tips That’ll Ignite Your Online Business, Blog, or Brand appeared first on Work From Home Happiness.